Blog - Explore Love Stories in Royal Crown Derby’s Museum. Explore Love Stories in Royal Crown Derby’s Museum. Valentine’s Day is the perfect day to look for love in the most unlikely of places, so with this in mind why not explore the hidden love stories within the museum based in the Royal Crown Derby’s Osmaston Road Factory, Derby. Renowned for having the largest collection of Derby Porcelain in the world, the museum has a beautiful collection of fine bone china pieces depicting the fascinating history behind Royal Crown Derby, notably the figures which can be seen as pairs, a male and female or sculpted in a set of four compromising of two males and two females. 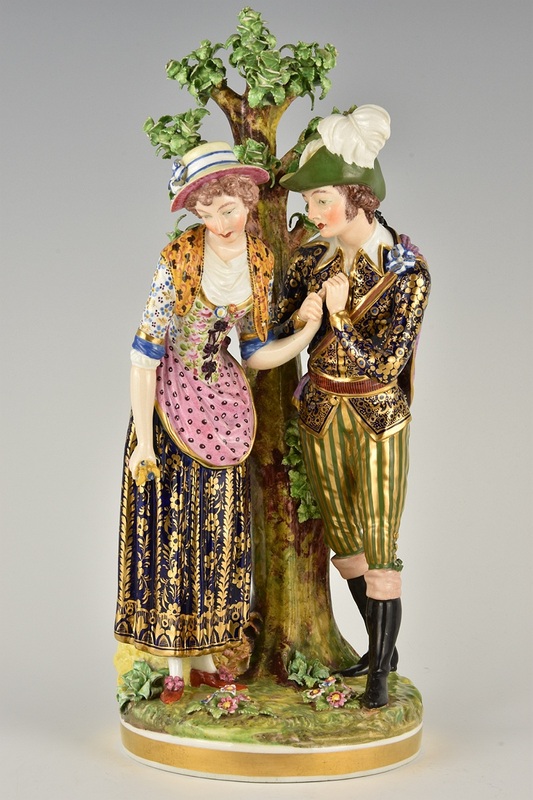 Traditionally, figure modelling seems to pair two figures together, so pairs are in abundance with shepherds and shepherdesses, fruit and flower sellers and gardeners or travellers (best known as a tinker) with their female companions. The first pair of lovers displayed proudly in Royal Crown Derby’s museum is the ‘Ranelagh Dancers’, could they possibly be a courting couple? During the 18th Century, the Ranelagh Gardens in Vauxhall were considered one of London’s most fashionable pleasure gardens, it was a place to see and be seen. Maybe this wonderful couple had been exchanging glances and he has finally asked her to dance. Other stunning pieces displayed within the museum depict couples in groups, that is, more than one figure on the same base. These figures seem to tell more intimate stories between the two people. 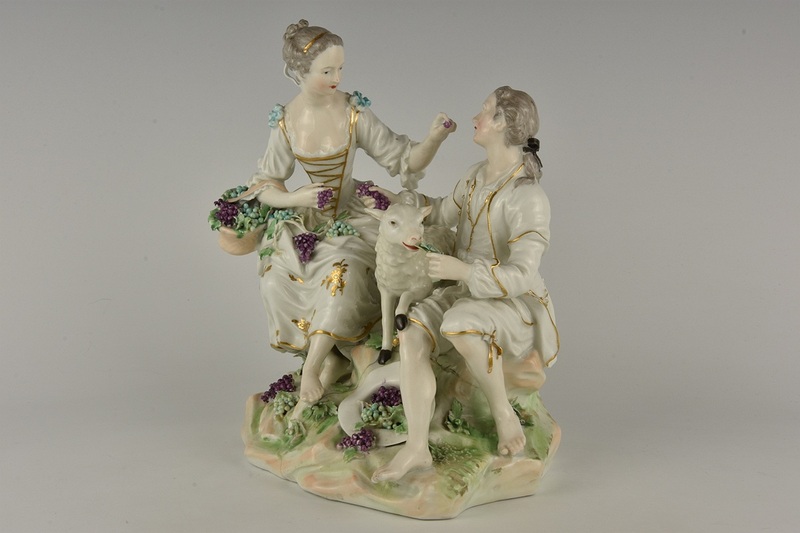 In the group called ‘La Bergere des Alpes’ two lovers sit upon rocks under a tree with a lamb at their feet. They hold hands and gaze into each other’s eyes, the quality of the modelling and the composition, connecting the two figures with a touch of the hand and the eye contact really brings them to life. It is a love story that leads you into their world. In ‘Pensent-ils au raisin?’ depicts an intimate scene of a couple with a lamb, the women feeds the man grapes from a basket as he looks lovingly up at her. 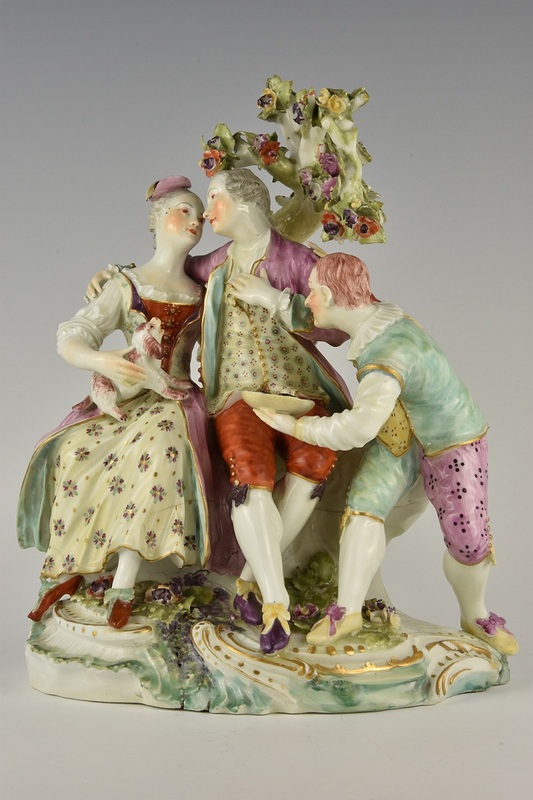 This figurine is an interpretation of an engraving by Jacques Philippe Le Bas, after an 18th Century painting by Francois Boucher by the same name. The name translates into ‘Are they thinking about the grape?’ displaying playful innuendo which was popular at this time. 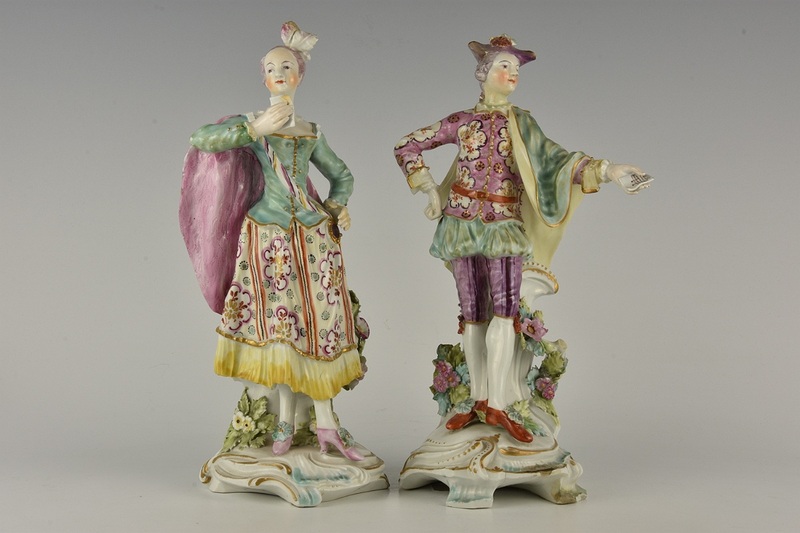 The figurine Isabella, Gallant and Jester, taken from a Meissen model, depicts a scene from the Italian Commedia dell’Arte. The Commedia dell’Arte was a form of improvisational theatre started in 16th Century Italy. It was loud, colourful and comical theatre. The piece portrays Isabella being wooed by her Gallant but he has little chance of success, with the Jester mocking him. 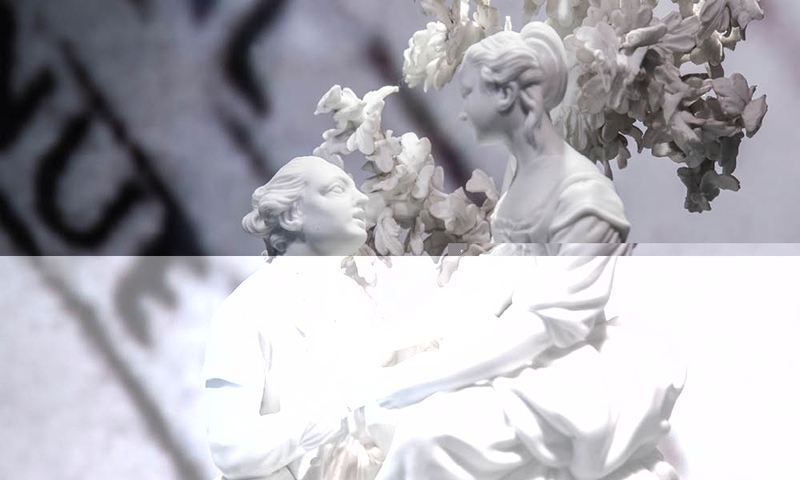 The figurine called Palemon and Lavinia has been inspired by a poem called The Four Seasons, by James Thomson published in 1728. They were popular characters during the 18th Century and can also be found portrayed in prints of the time. 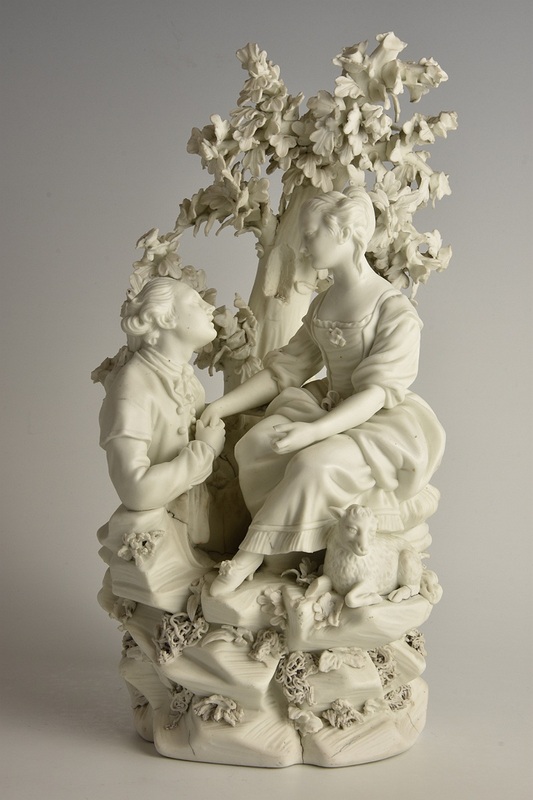 The fact that characters from this poem can be found as porcelain figures almost one hundred years later demonstrates the appeal of the love story between Palemon and Lavinia and is one that remains popular today. Here the gentleman is holding the hand of a country girl, as she looks down demurely as he is declaring his love for her. Palemon has fallen for one of the girls working in his own fields, in describing Lavinia, Thomson says ‘Thoughtless of beauty, she was Beauty’s self’. It is the classic story of love conquering all. Royal Crown Derby’s accredited museum provides an intimate collection of romance, courting couples and love stories that stand the test of time. Romance can also be seen in the way these stories and characters are portrayed in a rural idyll that never existed, during the period when these sculptures were created. Located on the first floor of the Visitor Centre, the museum provides a fascinating insight into the company’s heritage. Discover Royal Crown Derby’s history whilst perusing the museum’s remarkable collection from the extensive archives to the current exhibition. For opening times and further information about Royal Crown Derby’s museum and the Visitors Centre please click the link here.